1. 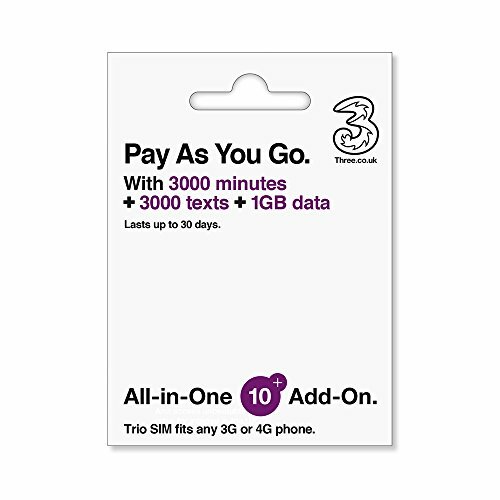 A trio size (nano/micro/std) SIM which will fit all phones, make sure your device is GSM unlocked either 3G or 4G compatible. 1. Simply insert SIM into your unlocked phone, make sure you enable roaming in settings. 2. Wait for the signal, accept Three UK setting messages, then you are all set to go. 4. Please note you cannot use the 3000 mins/ texts to call or text US numbers. In order to do this, you would need to add credit to the account by purchasing a top up voucher. Calls to USA costs 3p per minute. 1GB data to use in 71 destinations, 3000 voice mins and 3000 texts can ONLY be used to call UK numbers, AND European numbers WHILST you are in Europe. If you have any questions about this product by Three UK Mobile, contact us by completing and submitting the form below. If you are looking for a specif part number, please include it with your message.